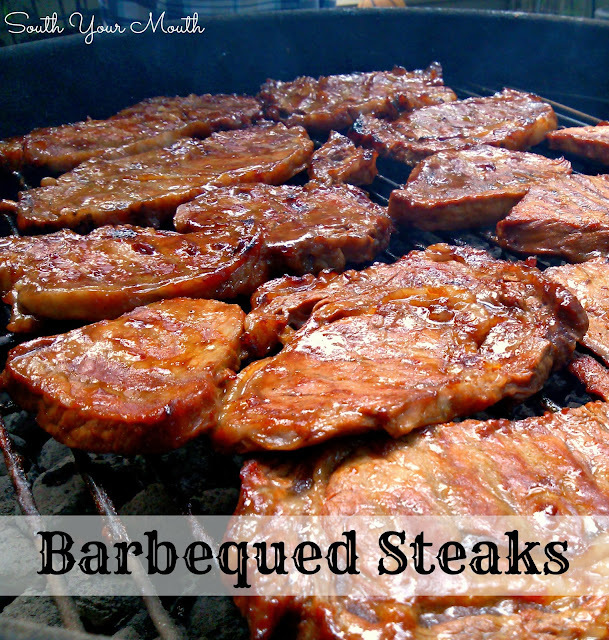 Thinly sliced grilled steaks marinated in homemade barbeque sauce. OK, let’s establish something before you look at this recipe. If you like rare to medium steaks (like I do), throw everything you think about steak out the window for a minute. Let's all take a moment of silence to appreciate a two-inch thick ribeye cooked medium-rare. OK. Good, because that's nowhere close to what we're cooking now. Apples and oranges, folks. Apples and oranges. This is not a traditional steak recipe. This cooks the steaks well done. And it’s OK. Because they’re thin and marinated and basted and tender and awesome anyway. You just can’t think of this recipe like you usually think about steak. And do not spend a bunch of money on your steaks. We usually get thinly sliced sirloins or chuck steaks (1/2” to 3/4” inch thick) and cut them in to serving-sized pieces or, if I happen upon one of those family packs of the thinly sliced ribeyes, those work great too. My point is, we’re going to cook the bejeezus out of these so you don’t have to spend a lot of money on premium cuts of steak. Oh! I totally forgot the best thing about this recipe! It’s my granddad’s creation! He was a very accomplished cook who loved to tinker in the kitchen and create his own recipes. And every time we make this, I think of him. Combine barbeque sauces, worcestershire sauce, molasses, honey and steak sauce in a large sealable container or zip-top bag. Add steaks and marinate overnight or for at least 8-10 hours. Remove steaks from marinade and season with salt and pepper. Reserve marinade. Grill over medium to medium-high heat until cooked through (approximately 10 minutes on each side). Baste with reserved marinade half way through cooking time. You can't cook these too hot or the marinade will burn (there's a lot of sugar in bbq sauce). *Here in central South Carolina, we use mustard based barbeque sauce a lot so it’s easy for us to find. Based on the hard-nosed scientific research I've done (aka, FB messages to my friends who live elsewhere), most grocery stores in the US carry at least one variety of it. If you can’t find it anywhere, you can order the Sticky Fingers Carolina Classic online here. I'm a Maurice Bessinger kinda person.